Whether you are missing one tooth or all of your teeth, we can replace your missing teeth using the most state-of-the-art implants available today. Learn more about dental implants, click here. If you suffer from jaw pain, headaches, facial muscle or neck pain and/or tenderness, or you grind your teeth at night, click here. If you always wanted to have straight teeth, but didn't want to go thru the embarrassment of having metal braces, click here. 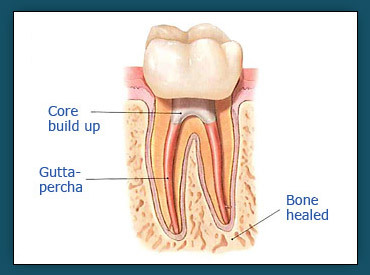 Endodontic treatment is necessary when the pulp becomes inflamed or infected. The inflammation or infection can have a variety of causes: deep decay, repeated dental procedures on the tooth or a crack or chip in the tooth. In addition, a blow to a tooth may cause pulp damage even if the tooth has no visible chip or cracks. 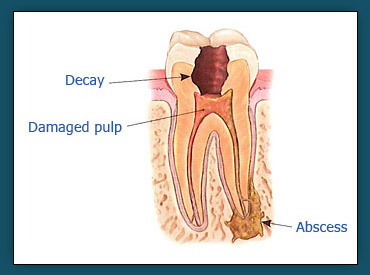 If pulp inflammation is left untreated, it can cause pain or lead to an abscess. Signs of pulp damage include pain, prolonged sensitivity to heat or cold, discoloration of the tooth and swelling and tenderness in the nearby gum. Sometimes there are no symptoms. 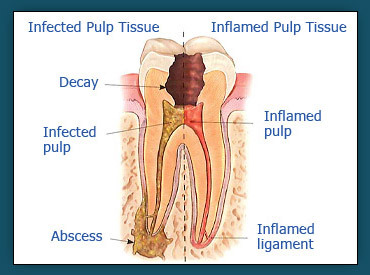 Many endodontic procedures are performed to relieve the pain of toothaches caused by pulp inflammation or infection. With modern techniques and anesthetics most patient report that they are comfortable during the procedures. For the first few days after treatment, you tooth may feel sensitive, especially if there was pain or infection before the procedure. This discomfort can be relieved with over-the-counter or prescription medications. Follow our post-op instructions carefully. Your tooth may continue to feel slightly different from your other teeth for some time after your endodontic treatment is completed. Step 1: We examine and x-rays the tooth, then administers local anesthetics. After the tooth is numb we place a small protective sheet called a "dental dam" over the area to isolate the tooth and keep it clean and free of saliva during the procedure. Step 2: We make an opening in the crown of the tooth. Very small instruments are used to clean the pulp from the pulp chamber and root canals, and to shape the space for filling. 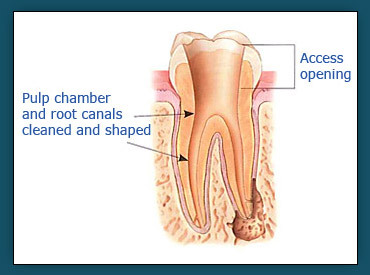 Step 3: After the space is cleaned and shaped, we fill the root canals with a biocompatible materials, usually a rubber-like material called "guttapercha." 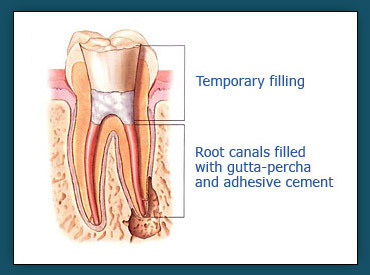 The guttapercha is placed with adhesive cement to ensure complete sealing of the root canals. In most cases, a temporary filling is placed to close the opening. The temporary filling will be removed before the tooth is restored. Step 4a: After the final visit, you must return to have a crown or other restoration placed on the tooth to protect and restore it to full function. 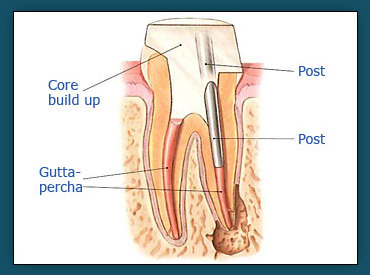 Step 4b: If the tooth lacks sufficient structure to hold the restoration in place, we may place a post inside the tooth. You can expect soreness after a root canal procedure for a few days. You should avoid chewing on the side of your mouth where the procedure was performed so you do not irritate the area and also to ensure that the temporary restorative material properly sets. You will also need to take an antibiotic to treat any remaining infection in your tooth. If you notice an increasing amount of pain or tenderness, a reaction to the medication, or the loss of the temporary restoration (filling) call us immediately.